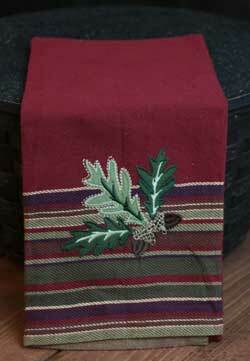 Perfect fall decor for your kitchen, this fall kitchen towel is beautiful in burgundy with stripes in greens and plum, with appliqued leaves and acorns. 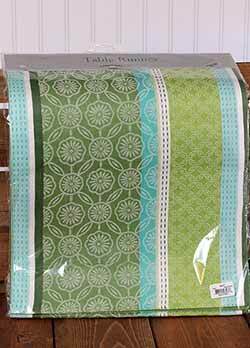 Wonderful for your apple decor, this green waffle weave kitchen towel features an embroidered basket of apples. Great for fall decorating! 100% cotton. Autumn Acorns Mixing Bowls, by DII. The Autumn Leaves collection is beautiful in sage green, celery, plum purple, and burgundy. This is for the Ceramic Bowls, sold in a set of THREE. Outsides are elegantly fluted, and embossed with vines and acorns. Small (Light Olive) is 7 x 3.75 (1.25 quarts), Medium (Olive) is 8.75 x 4.75 inches (2.5 quarts), Large (Wine) 10 x 5.5 inches (4.25 quarts). 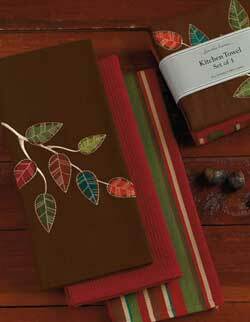 Autumn Leaves Embroidered Kitchen Towel - This fall kitchen towel features colorful embroidered leaves on a chocolate brown lightweight woven cotton. Perfect for fall decorating! Banana Split Embroidered Dishtowel, by DII. 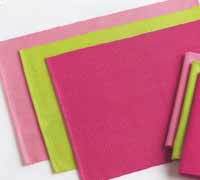 Part of the Sweet Shoppe Collection, featuring a theme of cupcakes and candy, in a palette of pinks, lime, and aqua. 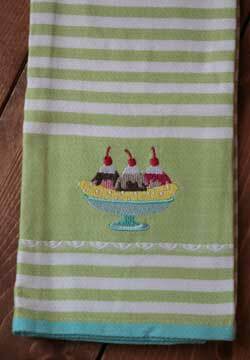 This is for the Banana Split Embroidered Dishtowel - features an embroidered banana slip on a green dishtowel. Measures 18 x 28 inches. Other collection items also available! Basics Plum Napkin, by DII. Part of their Basics Collection, a wide variety of gorgeous solids. 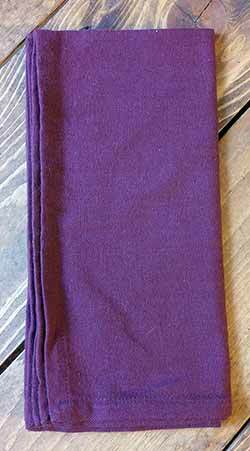 This is for the Plum Napkin, which is solid plum purple color. 100% cotton. Machine washable (see label for care instructions). Bear Applique Dishtowel, by DII. This for the red towel on the Left - features an embroidered and applique bear, and reads: Bear Country Inn. Part of the Pine Peak Lodge Collection. Measures 18 x 28 inches. 100% cotton. Matching accessories also available! Photo courtesy of DII. Braided Indoor/Outdoor Placemat, by DII. This line of round placemats are perfect for indoor or outdoor use, available in a variety of colors. This is for the Berry Punch Placemat - a red the color of fruit punch, with a slight raspberry pink to the red. 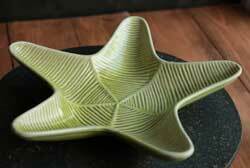 Measures 14.75 inches in diameter. Made of outdoor-safe polypropylene. Shake to clean, damp sponge soiled areas. Napkins and other colors available! Part of the Juicy Watermelon Collection. Black Petite Stripe Napkin, by DII. 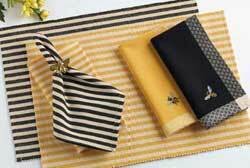 This is for the black striped napkin in photo, which is black and creme colors. Part of the Honey Bee Collection. Measures 20 x 20 inches. 100% cotton. Machine washable (see label for care instructions). Other items in the collection also available! 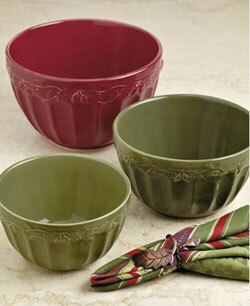 Features a palette of wine red, blackberry purple, taupe, and olive green. Measures 20 x 20 inches. 100% cotton. Part of the Fall Berries Collection. Blueberry Waffle Weave Dishtowel, by DII. 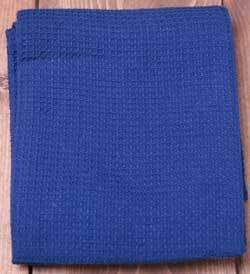 Cobalt blue, woven "waffle." Measures 18 x 28 inches. 100% cotton, machine washable. Part of the Basics Collection. 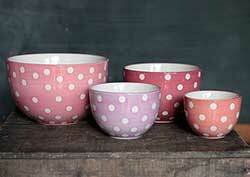 Part of the Chef Butterfly Collection, featuring a polka pattern in a pretty palette of pinks and lavender. Candy Stripe Heavyweight Dishcloth, by DII. 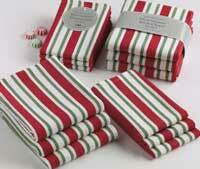 This heavyweight, woven cotton dishcloth features candy cane-like stripes in white, green, and red. Sold individually (priced per cloth). 100% cotton. Part of the Snow Day Collection. Checkers Weave Placemat, by DII. These heavyweight checkered-weave placemats are reversible, versatile, and lovely! This is for the Russet placemat, a reddish pumpkin orange (this is the 2nd placemat down on photo, the one right below the sunflower one). Measures 13 x 19 inches. 100% cotton, machine washable. Sold individually. Other colors available. Chestnut Napkin, by DII. Part of their Basics Collection, a wide variety of gorgeous solids. 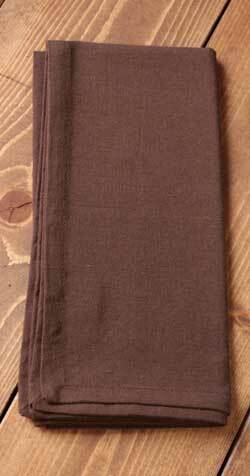 This is for the Chestnut Napkin, which is a rich nutty brown (this is the solid brown one in photo). Measures 20 x 20 inches. 100% cotton. Machine washable (see label for care instructions). Placemats also available, as well as other colors. Chicks Embroidered Dishtowel, by DII. 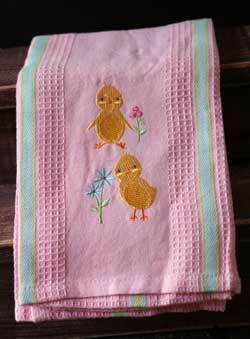 Pink waffle weave dishtowel with embroidered chick design. Part of the Daisy Plaid Collection. Measures 18 x 28 inches. 100% cotton. Machine washable. Other items in the collection also available! 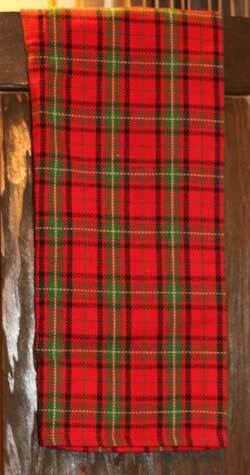 Christmas Plaid Heavyweight Dishtowel, by DII. 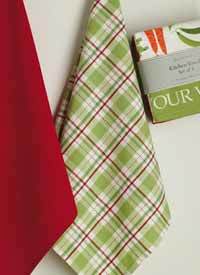 This heavyweight, woven cotton dishtowel feature a tartan plaid in classic red and green. Priced per towel. 100% cotton. Dishcloths also available! Christmas Trees Embellished Dishtowel, by DII. 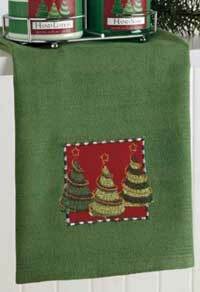 Features embroidered trees and red background on a soft green cotton dishtowel. Measures 18 x 28 inches. 100% cotton. Machine washable, see label for care details. Cocoa Brown Placemat, by Design India Imports. 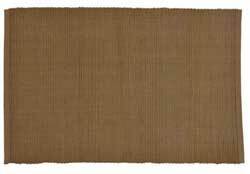 Part of the Garden Grove Collection, is for the basic solid ribbed placemat in the Cocoa Brown color. 100% cotton. Machine washable (see label for care instructions). Crab Embroidered Dishtowel, by DII. 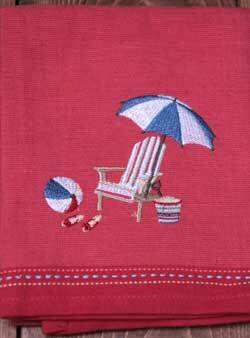 This sandy beige dishtowel fatures embroidered images of a red crab and white shells! Part of the Nautical Collection. 100% cotton. Measures 18 x 28 inches. Machine washable (see label for care instructions). Crab Napkin Ring, by DII. 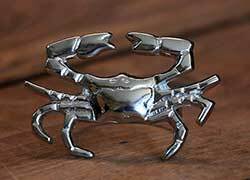 Adorable cast brass crab-shaped napkin rings with a shiny nickel-plated finish. Part of the Coastal Collection. Sold individually. 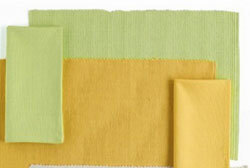 These cotton placemats are available in bright sunny spring colors, and feature a simple white dobby stitch. This is for the LIME ZEST placemat, a bright and happy limey green. 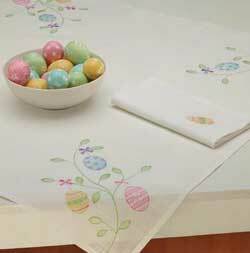 Easter Egg Garden Tablecloth, by DII. Easter eggs on a leafy vine embroidered on each corner, against an off-white background. Part of the Easter Brunch Collection. Measures 60 x 84 inches. 100% Polyester. Hand wash cold, line dry, low iron. Other items in the collection also available! Elk Applique Dishtowel, by DII. 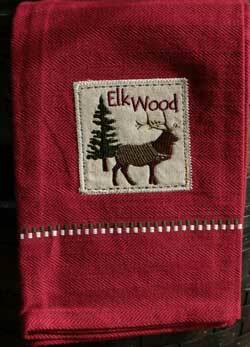 This cranberry red dishtowel features an embroidered and applique elk and tree, and reads: Elk Wood. Part of the Pine Peak Lodge Collection. Measures 18 x 28 inches. 100% cotton. Matching accessories also available! 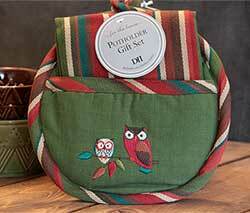 Perfect for owl lovers, this green pot holder features embroidered towels, and includes a matching striped kitchen towel. Fall Berry Stripe Jacquard Tablecloth, by DII. The Fall Berries Collection features a palette of wine red, blackberry purple, and touches of taupe and sage green, and is accented with a berry sprig. 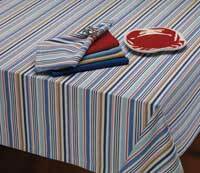 This is for the Fall Berry Stripe Jacquard Tablecloth in the 52 x 52 inch size. Features the plum purple and wine red colors with a leaf sprig design. 100% cotton. Other matching linens available! The Fall Berry jacquard towel features a woven design of leafy vines, and stripes in a palette of wine red and plum purple. Also great fall decor! Fish Lake Applique Dishtowel, by DII. 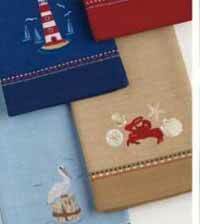 This for the tan towel in the middle - features an embroidered and appliqued trio of fishes, and reads Fish Lake. Measures 18 x 28 inches. 100% cotton. Matching accessories also available! Photo courtesy of DII. Flame Red & White Checkers Tablecloth, by DII. Classic cheery picnic or Italian bistro style, this tablecloth features a flame red and white checked pattern. This is for the 60 x 84 inch size. 100% cotton. Machine washable. Other matching items in the collection also available! French Taupe Napkin, by DII. Part of their Basics Collection, a wide variety of gorgeous solids. 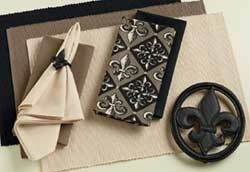 This is for the French Taupe Napkin (the darker one in photo) - a lovely tan/grey color. Measures 13 x 19 inches. 100% cotton. Machine washable (see label for care instructions). 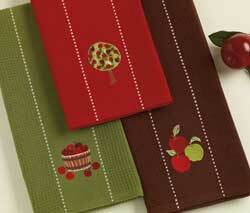 Placemats also available, as well as other colors. Coordinates with the Fleur De Lis Collection. Fresh Green Napkin, by DII. 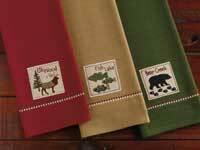 Part of their Basics Collection, these napkins are solid colored, 100% cotton, and machine washable/dryable. This is for the FRESH GREEN napkin, which is a soft celery green color. Measures 20 x 20 inches. Other Basics items also available! Fresh Green Placemat, by DII. Part of their Basics Collection, this is a ribbed style placemat, straight edges (no fringe), 100% cotton, and machine washable/dryable. 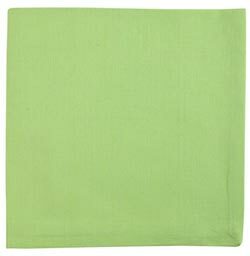 This is for the FRESH GREEN placemat, which is a soft celery green color. Measures 13 x 19 inches. Other Basics items also available! 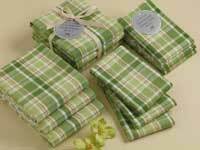 Fresh Greens Plaid Dishtowel, by DII. 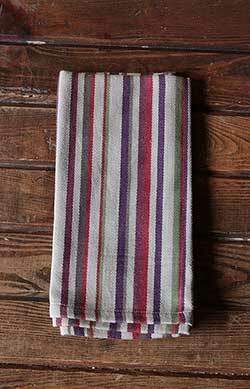 This cotton dishtowel features a fresh plaid of greens, red, and white. Measures 18 x 28 inches. 100% cotton, machine washable. Part of the Garden Veggies Collection. 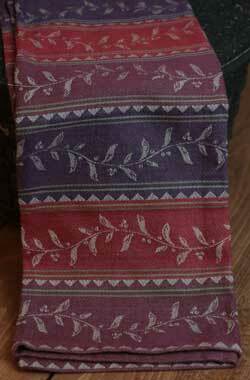 Fresh Watermelon Embroidered Dishtowel, by DII. 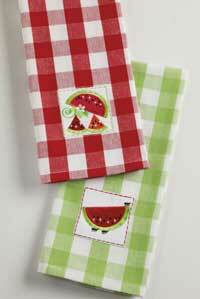 Red and white checked dishtowel with embroidered watermelon slices (upper towel in photo). Measures 18 x 28 inches. 100% cotton. Machine washable, see label for care instructions. Part of the Juicy Watermelon Collection. Garden Gate Jacquard Table Runner, by DII. Part of the Garden Gate Collection. Measures 13.5 x 72 inches. 100% Cotton. Hand wash cold, line dry, low iron. Other items in the collection also available! Garden Plaid Heavyweight Dishcloth, by DII. Cotton woven plaid dish cloth in green, white, and red. Comes as a set of 3. 100% cotton. Machine washable, see label for care instructions.